This is the highest sign up bonus we have seen (or should we say Scene ;-) ) on this card since we started tracking it! 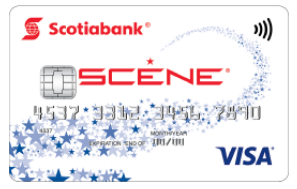 As of today if you apply for and are approved for the no fee Scotiabank SCENE Visa card you can earn a bonus of 5,000 SCENE Points. The bonus is awarded after spending $500 on the card within the first three months of having the card. $500 isn't too bad, can be hard for those students who get this as their first card but really is should be achievable for most. Once you receive the sign up bonus you have enough points for five regular priced movies at Cineplex theatres across Canada or $45 off purchases at places like Sport Chek, Cara group of Restaurants and more! Find out more about this offer or apply for the card here. To be eligible for the 5,000 bonus points, you must have at least $500 in net purchases (purchases less returns, refunds or other similar credits) posted to your SCENE Visa account in the first 3 months from the account opening date. The 5,000 bonus points will be awarded within 2-3 business days of the completion of the $500 in purchases. Only one welcome bonus is awarded per SCENE Visa account. In cases where both the primary and co-borrower cardholders are SCENE members, the 5,000 bonus points will be credited to the cardholder making the first purchase. Offer applies to new accounts opened by October 31, 2017. SCENE members can redeem 1,000 points for a free General Admission movie ticket. Offer not applicable to SCENE Student Visa card.